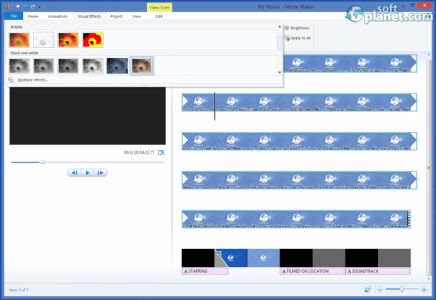 SoftPlanet makes it possible for everyone to get free Windows Movie Maker download directly from our servers. There is no registration needed for downloading. Windows Movie Maker is a video editing software application that allows you to transform audio files, images and clips into a movie. It supports all types of multimedia files, no matter if you add photos and videos from your camera, thumb drive or any other source. The app is absolutely free of charge and is a very good addition to your Windows operating system. Windows Movie Maker allows you to achieve a professional look of your projects by adding lots of effects. For instance, you can apply fade effects, adjust the speed, split and trim. Sometimes you will need to connect to frames and you will need to do it somehow. Thanks to the multiple transitions and animations available, this seems to be a very simple task. You can implement music to the whole movie or just a part of it. Once you have finished you project you can save it to multiple formats including ones that are specific for mobile devices. You can even have your movies in HD display or burn them to DVD disks. All of you projects can be easily published on Facebook, YouTube or SkyDrive. The interface of Windows Move Maker is very simple actually. It reminds of the one in MS Office. Basically, you have several tabs on top that collect all available features. Thus you can access them with a few clicks only. The preview panel is placed to the left, where you can use the basic control functions like play, stop, rewind and forward. You can put it on full screen as well, if you want to get an even clearer view over your movies. All resources, effects and elements are placed to the right. You can easily reorganize them with a simple drag and drop. Unlike some other similar applications, Windows Movie Maker provides you with a picture of the effects you are about to deploy. Thus you can get a clearer view what actually will happen if you apply this effect or transition. “A picture is worth a thousand words”, right? Working with Windows Movie Maker 2012 Build 16.4.3508.0205 seems to be a great pleasure. It is really easy to navigate through all menus. However you will notice that it needs some time to process larger videos just right after you add them to your project. Despite that the app works very smoothly. Applying different effects is as easy as pie. Rearranging project components is very simple as well. Thus you can create a movie within minutes. 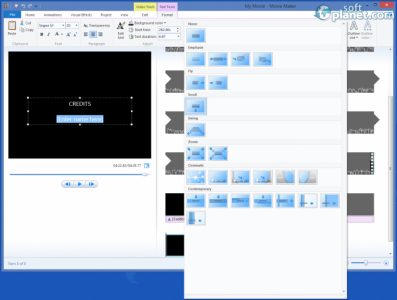 Windows Movie Maker 2012 Build 16.4.3508.0205 is a very handy software solution if you want to create a video surprise for your friends and family for their birthday or other occasions. The app allows you to create and edit video projects absolutely for free. It is a great addition to your Windows operating system. Grab it now and amaze the world with your outstanding movies. Windows Movie Maker is VIRUS-FREE! Our security scan shows that Windows Movie Maker is clean from viruses. The current version of Windows Movie Maker has been scanned by our system, which contains 46 different anti-virus algorithms. That ensures that Windows Movie Maker 2012 Build 16.4 is 100% safe for your computer.